Sandford St Martin face a fight to pull away from the relegation zone in the Cherwell Cricket League. The Ledwell Road side remain rooted to the foot of the division two table after they fell to a 37 run defeat at home to Oxford II. Richard Musk 55 led Oxford to 194 all out, ably backed by Ruairi Willis 37 and Balaji Ramalingam 30 despite Mark Robey taking 3-16. Ollie Ong struck 76 in Sandford’s reply but Andrew Busby claimed 4-27 as the home side fell for 157 in the 45th over. Leaders Westbury posted a convincing 90 run victory over second-placed Wolverton Town to stretch their lead at the top of division two. Batting first, Westbury set 206-9 in their 53 overs with the top three batsmen all doing well with the bat, Olly Tice hit 51, William Gurney 43 and Tom Gurney 39. There were also good contributions from the lower middle order following a small middle order collapse. In the chase, Westbury took regular wickets as Graham Judd 3-32 ripped through the top order. Richard Tredwell’s 4-17 sorted out the second half of the order out as Wolverton were dismissed for 119 runs in the 35th over. Cropredy moved up to second place as they saw off visitors Aston Rowant II by five wickets. Patrick Somerton claimed 3-32 to help to restrict Rowant to 153-8 in which James Reynoldson 40 led the way and then Jake Walters struck 79 to steer Cropredy to 155-5 in the 32nd over. Great Brickhill kept up the pressure on division one leaders Oxford Downs with a crushing nine wicket win at basement boys Banbury II. Banbury opted to bat and, after a tricky start which saw them five down with just 63 on the board, Oxon under-17 captain George Tait 66no and Richard Simpson 44 aided a turnaround in fortunes. With Chloe Hill 23no adding some late order impetus, Banbury eventually set 202-7 in their 53 overs. 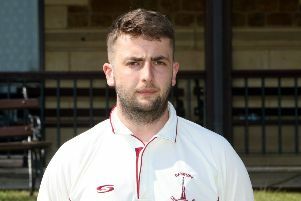 But former England under-19 and Northants batsman Mark Nelson made light work of the target, smashing an unbeaten 124 in 91 balls to steer his side home in the 36th over, Austin John also scoring 54no.